1.1 Why Write This Book? 4.4 BVOC and Climate Change: Warmer = More Fragrant World? 21.1 Wildland Fires: Part of the Ecosystem Lifecycle or a Result of Anthropogenic Stress? There are significant pressures from climate change and air pollution that forests currently face. 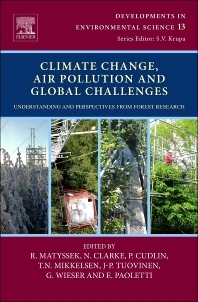 This book aims to increase understanding of the state and potential of forest ecosystems to mitigate and adapt to climate change in a polluted environment. It reconciles process-oriented research, long-term monitoring and applied modeling through comprehensive forest ecosystem research. Furthermore, it introduces "forest super sites for research” for integrating soil, plant and atmospheric sciences and monitoring. It also provides mechanistic and policy-oriented modeling with scientifically sound risk indications regarding atmospheric changes and ecosystem services.